Central Leeward Highway, adjacent to the Venetian Road and Bight areas. Leeward Highway in the Cheshire Hall region of Proivdenciales. 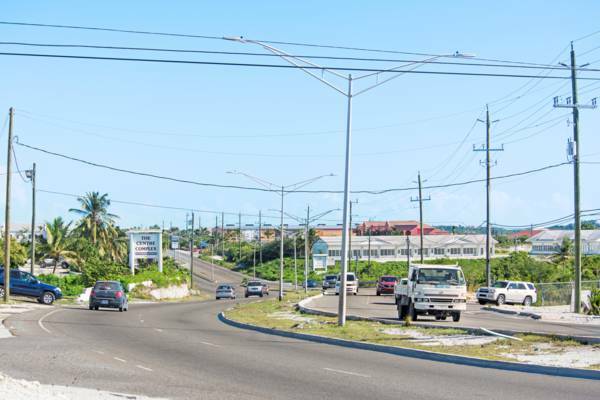 Spanning the distance from Long Bay to Downtown, Leeward Highway is the main motorway on Providenciales and the largest in the country. Most of the island’s stores and businesses are found on Leeward Highway, as is the hospital, the electric power plant, and other utilities. In 2004, Leeward Highway was upgraded from single lanes in each direction to dual lanes. At that time, concrete medial curbs, lighting and slightly more comprehensive signage was also constructed. As the busiest road in the Turks and Caicos, most of the vehicle collisions in the country occur here. Poor driving by jitneys and taxis, and the misuse, small size of and lack of roundabouts are a significant cause of crashes. Efforts have been made to educate drivers, yet reckless and dangerous driving remains an issue. Leeward Highway was the first main artery road on Providenciales and one of the first to be paved. Starting in the mid 1990s, the single-lane highway began to fall into disrepair and became extremely treacherous to drive on by the start of the new millennium. In 2004, the Government issued $8 millon worth of bonds to cover the resurfacing cost of the highway (including a few other roads and the downtown ballpark). Interest on the bonds was 1% above the three month London Interbank Offered Rate. It was at this time that the road was widened to a dual-lane carriageway. Last reviewed by an editor on 2 January 2019.